In Africa you can find some really unusual places to sleep including treehouses, rustic cabins, cruise boats, luxury trains and most excitingly of all – star beds. The star bed is a relatively new phenomenon but it is proving incredibly popular and I can see why. It combines the excitement and atmosphere of camping with the luxury and comfort of a safari lodge. Star beds are the name given to beds out in the open, giving you the opportunity to sleep with nothing between you and the African night sky. Due to low light pollution in Africa the stars are incredibly bright and clear and you can see far more than here in the UK. The African night sky is one of the most under-rated marvels of this amazing continent and one of the most incredible aspects of the unique nature of the African bush. This is truly a magical, once in a life time experience and definitely one for a memorable honeymoon! Tswalu Kalahari is South Africa’s largest private game reserve, covering an area of over 100,000 hectares in the vast Kalahari wilderness. Tswalu takes conservation as its absolute priority which means numbers are kept low with a maximum of thirty guests at a time. The Malori Sleepout is the name of the star bed at Tswalu. Imagine sleeping in a luxury king-size bed on a raised deck in the middle of a game reserve, surrounded by the calls of nocturnal animals, with nothing between you and the brilliant stars of the Kalahari night sky. You sleep on a raised platform with a thatched overhang for protection should it rain. 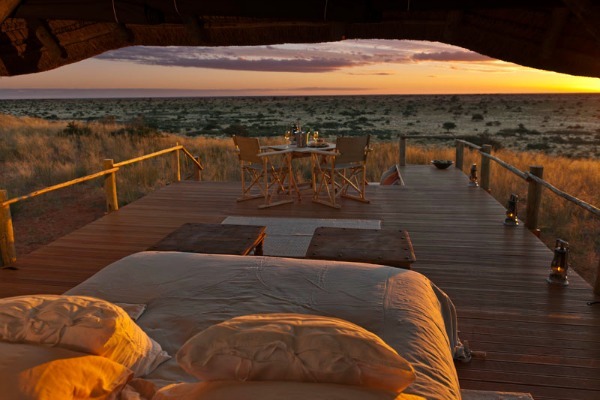 You can choose to sleep under the thatch or further along the deck where it is completely open to the night sky. The bed itself is luxurious with lovely linens and there is a private outdoor bathroom close by. The Malori deck was built to maximise the stunning surroundings and the bed has panoramic views of the vast plains of the Green Kalahari and its famous sunsets. You will be provided with sundowners and also a supper so that you can enjoy this space on your own. This is also available for families as the lodge can provide extra camp beds for the children. 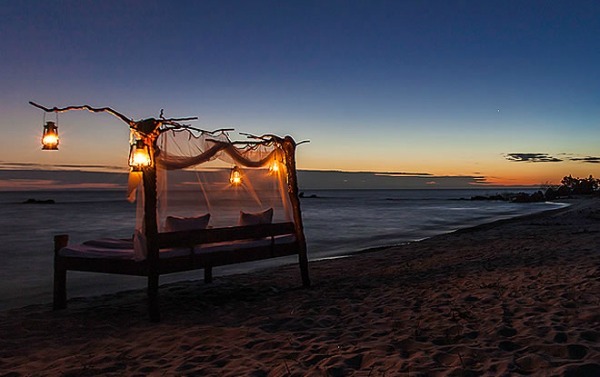 Nkwichi, is a halcyon paradise hidden on the pristine Mozambican shores of Lake Malawi. This is the place to come if you want to sleep out under the African stars but on a beach rather than in the bush. This is a truly tranquil and remote spot. With 8 secluded beaches set on 4 kms of Rift Valley coastline, Nkwichi is the perfect setting to discover a lost world on the shores of one of the world’s most beautiful lakes. 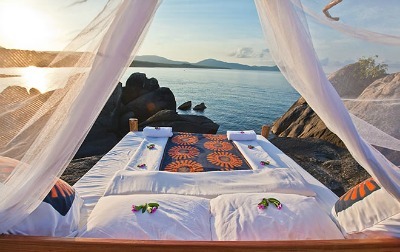 The best way to enjoy the unrivalled beauty of Lake Malawi is Nkwichi’s ‘Lake of Stars’ Bed’. Set on a deserted, virgin beach or on a private rock island close to the shore with Fish Eagles soaring overhead, this is the perfect way to soak up the glory of an African night-sky. Again you will be looked after with all the comforts of the luxury lodge at hand but with the peace and tranquillity of your own private outdoor location. The two sets of Star Beds are unique to Loisaba. The first and original set are located among a kopje of rocks in one of the eastern valleys overlooking the “Kiboko” waterhole. The second and newer set is located about 8 kilometres further south on the banks of the Ewaso N’giro River. These are perched on stilts above the river below and are reached by footbridge from the opposite bank. Each Star Bed dramatically designed, handcrafted wooden raised platform, and partially covered with a thatched roof. The homemade “Mukokoteni” (uniquely designed bed on wheels), can either be wheeled onto the open deck area for a night under the stars, or left under the shelter of the roof. All the beds have complete “four-poster” insect netting. The Star Beds are normally reached by one of many options; on foot, horse, camel or vehicle and with two sets now in place create a unique opportunity to travel between them both and the lodge as part of a Star Bed Expedition. Guests are guided and hosted by a team of traditional Samburu and Laikipiak Maasai warriors. Food is prepared in traditional camp kitchen on an open fire. 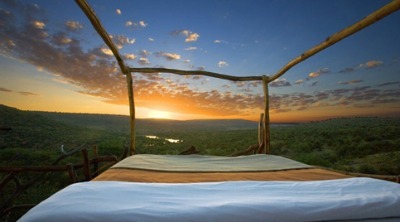 Both the Kiboko and Koija Star Beds comprise of 2 double sleeping platforms and one twin platform. Each double platform is designed for 1 or 2 people. The family platform accommodates 4 people (sharing bathroom facilities). Each platform is en-suite and has a large camp-style shower. The platforms are sited to ensure complete privacy. If you are looking for a truly unique experience and you fancy camping under the stars but in total comfort then give us a call and we can book one for you!